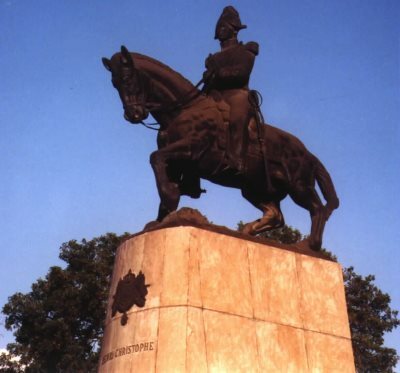 Statue of Henri Christophe in Haiti’s capital. AFRICANGLOBE – Little is known about Henri Christophe’s (English: Henry Christopher ) childhood. A great number of commentators report that he was born on Grenada island, a small nation in the Caribbean’s Lesser Antilles, and was the son of a freeman. His father, also named Christophe, was reportedly transported from West Africa or Central West Africa to Saint Domingue, the former French colony now known as Haiti. In 1779, Christophe served with the Franch Forces as a drummer boy with a regiment described as gens de couleur (English: people of color or color people) in the American Revolution. Thegens de couleur regiment fought at the Siege of Savannah at what is now the State of Georgia. Nine years later, in 1788, Georgia would become the fourth State admitted into the original thirteen colonies of the United States of America. France had lent troop assistance to the revolutionaries against England during the American Revolution. After the American Revolution, Christophe returned to Saint Domingue where he is reported to have worked as a billiard-maker, mason, sailor, stable-hand and waiter. He also managed a hotel restaurant in Cap-Français, then the capital of Saint-Domingue, that served the wealthy French slave-holders from the surrounding plantations. 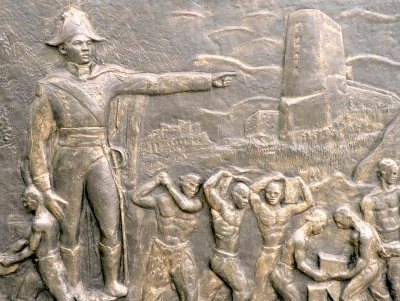 By August 1791, the Africans at Saint Domingue had rebelled against their condition under France’s tyranny of chattel slavery. The name they would adopt for their new nation would be “Haiti”, a word translated from the language of the native inhabitants as “land of mountains”. Christophe distinguished himself in the Haitian Revolution. While not as widely known as François-Dominique Toussaint L’Ouverture — the great military leader that secured native control over Saint-Domingue from the France by 1797 — Henri Christophe had distinguished himself by 1802 to become L’Ouverture’s brigadier general. Christophe fought alongside L’Ouverture in the north against the French. This included fighting against Spanish, British and French troops, all of whom had a strong interest in suppressing an uprising on the vast slave plantations established by the European colonialist over the Americas and Caribbean. By June 1802, L’Ouverture was captured by agents of Napoleon Bonaparte for France. He was deported from the island to France. The revolution continued, however. After 13 years of military battle between the French colony, the Africans would win their independence in the year 1804. They distinguished themselves in history as the first independent Black republic in the West. In 1806, Christophe and the Haitian general Alexandre Pétion overthrew Jean Jacques Dessalines. Subsequently, a short civil war broke out between Christophe and Pétion. By February 1807, Haiti was divided between Christophe whom had clear charge over the North, and Alexander Pétion who led the South of the new country. Christophe was elected president and served in that capacity from 1807 to 1811. On March 26, 1811, Henri proclaimed Haiti a republic nation and himself King, securing the title of Henri I. He served as Haiti’s king from 1811 to 1820. Henri Christophe is noted for his policy of construction and economic development in Haiti. Christophe was charged with transforming a slave-based economy into an effective and productive economy of a nation of newly freed people. While he improved the nations’ infrastructure he is noted by some of the commentators for his labor policies which involved harsh work conditions and a transfer of a great amount of the wealth being controlled by the republic. A trained mason, Christophe is noted for the construction of Sans Souci Palace and the fortress near Cap-Haïtien called Citadelle Laferrière. He also built six notable châteaux and eight palaces in the region. The Citadelle Laferrière is described as one of the great construction wonders of the era. In 1842, a major earthquake destroyed part of the fortress. By 1820, an insurrection had broken out in the northern region of Haiti and Christophe suffered an incapacitating stroke and reportedly shot himself. Today, Christophe is revered as a hero among the Haitians and many within the African diaspora. Christophe’s statue was raised at Champs de Mars in Port-au-Prince. Is America Disinventing Human Rights?